(In honor of ) the Emperor Caesar Trajan Hadrian Augustus, the Second Legion Augusta ( built this) under Aulus Platorius Nepos, governor. "Water brought for the Second Cavalry Regiment of Asturians under Ulpius Marcellus, governor". "(Made) in the ninth consulship of the Emperor Vespasian and in the seventh of Titus, acclaimed Imperator, in the governorship of Gnaeus Iulius Agricola." "The Century of Silvanus built 112 feet of rampart under the command of Flavius Secundus, Prefect." (To the Mother Goddesses), I, Antonianus, dedicate this shrine. But grant that the increase of my venture may confirm my prayers, and soon I will hallow this poem with golden letters one by one." CO(n)S(ul) III. 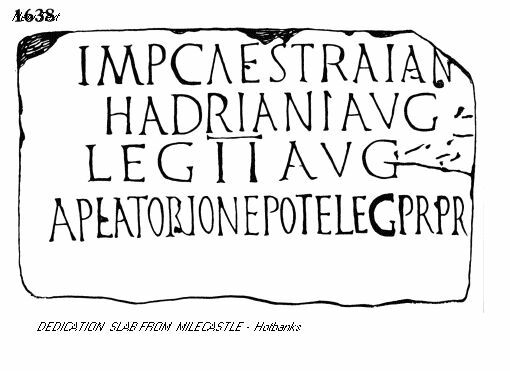 A RATIS M(ilia passuum) II"
" The Emperor Caesar Trajan Hadrian Augustus, son of the deified Trajan, conqueror of Parthia, grandson of the deified Nerva, father of his country, in his fourth year of tribunician power, three times consul. From Ratae 2 miles."